"Hambleton View Farm in Burton Leonard, Yorkshire has been farmed by my family for many years with 200 acres devoted to cattle, sheep and pigs. 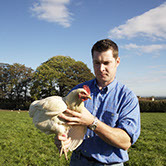 On the farm our hens get quality feed made from natural ingredients without added colour or antibiotics. 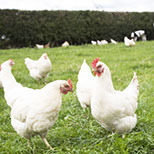 To ensure bird health we are committed to a programme of stringent and regular testing of our flocks which roam free every day. This includes vaccination and regular testing for salmonella. After being graded and packed on the farm the free-range eggs are delivered within three days of lay to guarantee product freshness. The majority of our customers throughout Yorkshire are high-quality, independent retail outlets including butchers, delicatessens, greengrocers and farm shops. 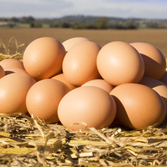 Our reputation for producing eggs of consistently high quality is the basis for the success of the business. We were awarded Best Rural Business 2013 as part of the Ackrill Business Awards in Association with Verity Frearson. Web Design and Build Graphic Design Partnership. © Ian Taylor Free-Range Eggs.